The month of August had turned into a griddle where days just lay there and sizzled. Last week, we spent 5 days in the wilds of eastern NC, a combination mini-vacation and working trip to further investigate the area around the Scuppernong River for the project I am working on with NCLOW. As you might expect, it was a tad warm (especially for the guy that loves cold weather), but we planned to be on or near water most of the week. Turns out, we are not the only ones that think that way. Returning to Columbia after a short excursion to the Outer Banks, we drove through Alligator River National Wildlife Refuge, in the hopes of seeing some wildlife. Temperatures had been hot all week with high humidity adding to the discomfort. We entered the refuge about 5:30 p.m., that time of day when wildlife begins to come out of the forest in search of an evening meal. 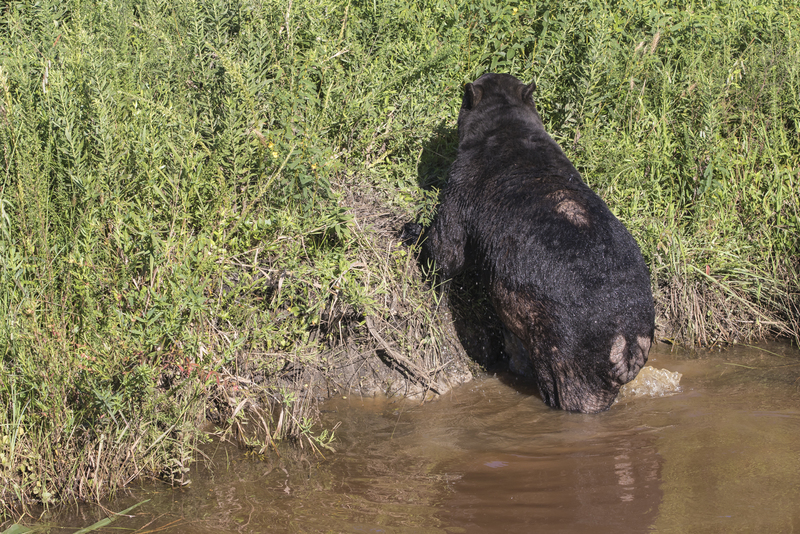 Driving down one of the main gravel roadways, Melissa spotted something off to the side in the canal…a bear cooling off in the water, a bear bathtub. It was a big bear, and it was just chillin’. When we pulled up, it glanced our way and then quickly went back into that chillin’ mode, eyes closed, almost a grin of cool relief on its face. The afternoon temperatures reached into the low 90’s that day, so I am sure this water, in spite of its less than desirable look, was quite satisfying. 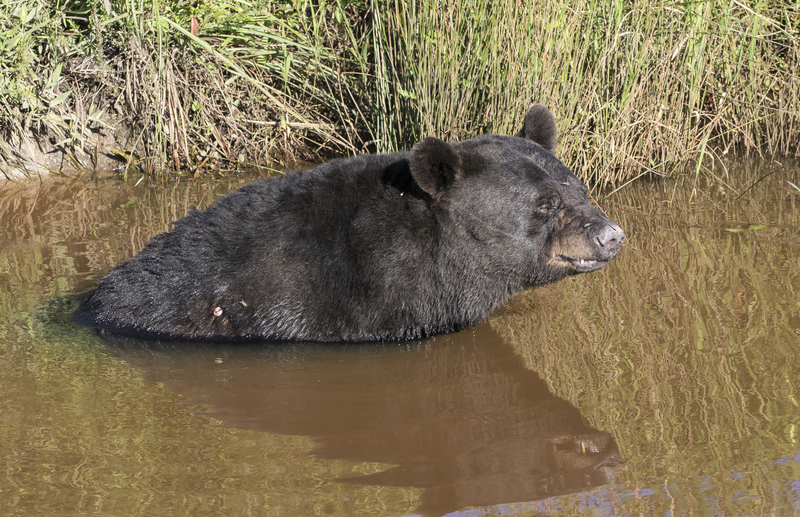 A black bear’s normal body temperature isn’t far from our own, around 98 to 100 degrees Fahrenheit (it is less during hibernation). The thick black fur is a good insulator, but can present problems in the heat of summer. 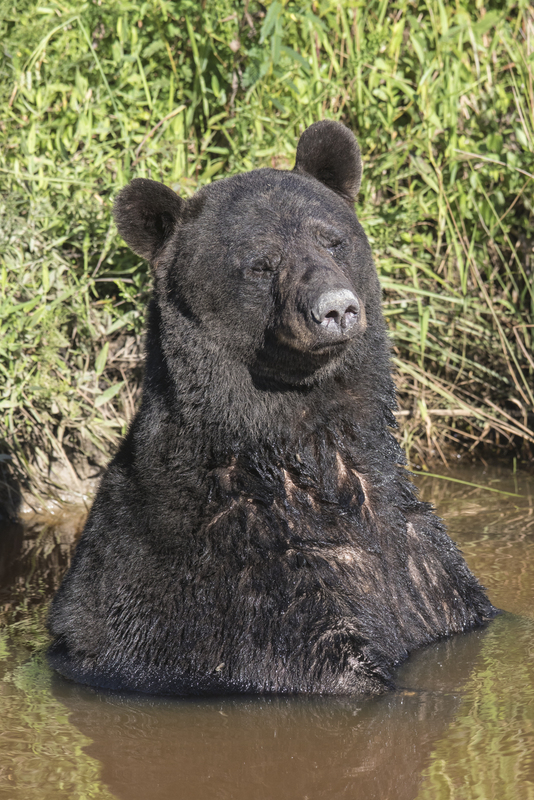 And, like dogs, bears lack sweat glands, so they must use other means to cool off – panting, lying in the shade, digging day beds to lie on the cool ground, or taking a nice plunge in the water. 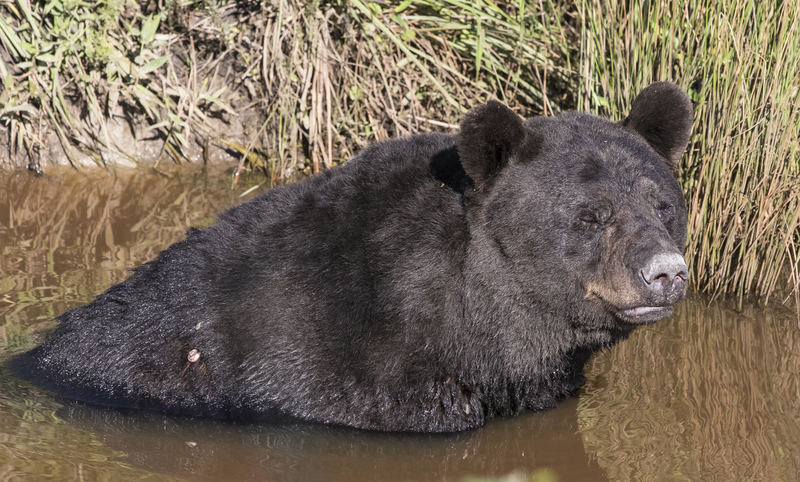 I have seen bears cooling off before in canals at Pocosin Lakes NWR, but have never been this close to one seemingly so relaxed in the cool water. Another vehicle soon pulled up, but the large bear did not seem concerned. 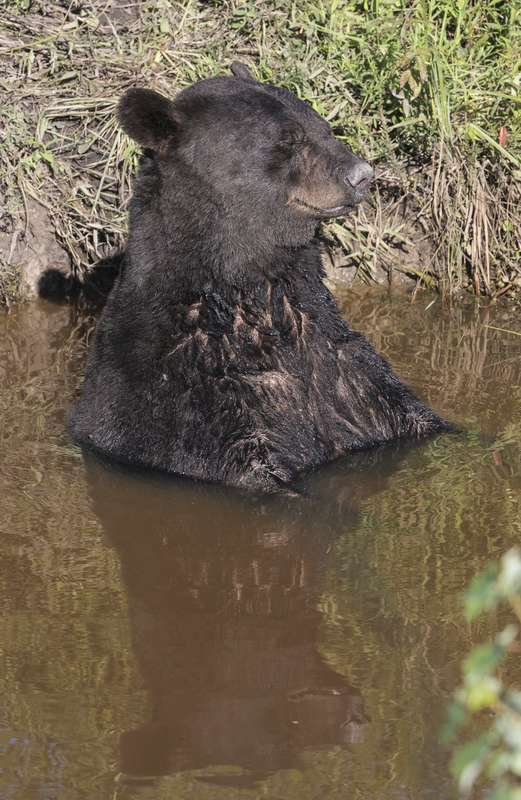 It did shift its posture and sat down in the water with all four paws presumably on the muddy bottom. After remaining almost motionless for a few minutes, the bear began to scrunch up its nose, revealing more of its teeth and tongue. We wondered what it was up to…trying to smell us (a third car had driven up at that point)? When I got home and looked at the images, I think I now know what was happening. Was this face in response to biting flies? 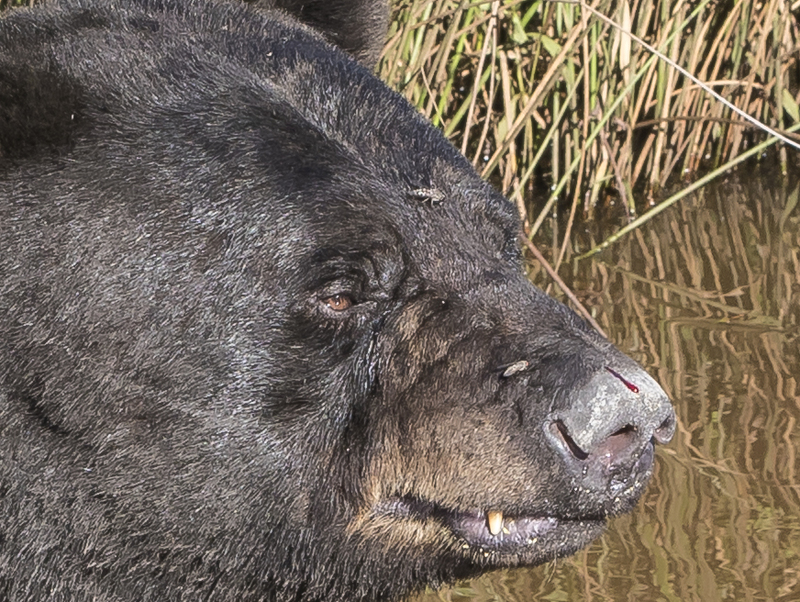 The photos taken when the bear was scrunching up its nose show a couple of biting flies on its snout. Pictures prior to that (like the first three photos above) show none of the irritating insects. The last few photos showed a tiny trickle of blood running off his nose. Look carefully at the previous image and you can see there was a fly in that spot. Guess I, too, would scrunch up my face under those conditions. After spending nine minutes with this big guy (no telling how long he was chillin’ in the canal before we arrived), he finally decided to head back up into the fields. I suppose he was headed for a nice corn dinner, and maybe some dense vegetation where those pesky flies couldn’t get to his sensitive nose. 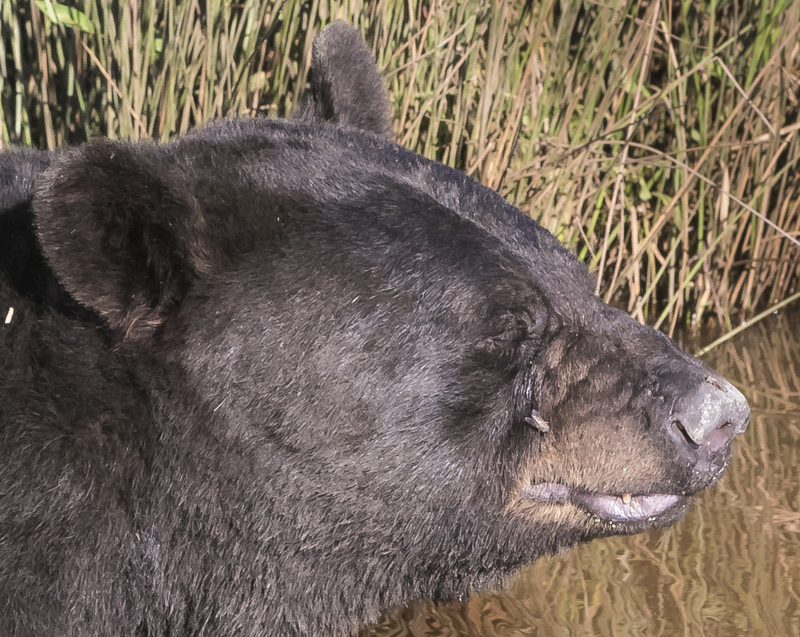 This entry was posted in Natural History, Trip report and tagged alligator river national wildlife refuge, black bear by roadsendnaturalist. Bookmark the permalink. Fantastic pictures. What a great experience. Thanks for sharing it. Thanks, Neena. Pretty amazing how many people have seen this bathing beauty! Thank you for the great narrative and fantastic pictures!